Iran and America: May I Have This Dance? Someone is about to get served! 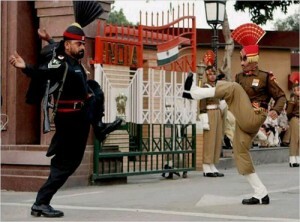 When you combine shadow boxing with peacocks and a dance-off you get the Wagah border closing ceremony. Since 1959, this flurry of fists and feet has marked the daily closing of the only road between India and Pakistan. British comedian Michael Palin calls it a “demonstation of how angry you can get without hitting anyone.” This doesn’t merely serve as a symbol of conflict between India and Pakistan. For US defense experts engaged with Iran, this dance of pride and prestige should serve as a model for those who might assume kinetic engagement with Iran is the best option. Robert McNamara’s first lesson in Fog of War was to empathize with your enemy, “I don’t mean ‘sympathy,’ but rather ‘understanding’—to counter their attacks on us and the Western World.” To understand the Iranian intent for their conflict with the west, one must understand their motives. In particular, Iran has no motive to get conventionally stomped into the dirt by the American military. They strongly value their strength and prestige as a regional power. While the small-boat swarms, ASCM threat, and naval posturing outside the Strait of Hormuz might be troubling indeed, that sense of trouble is their primary purpose. Being sent back to the stone-age in exchange for a short but irritating jump on US forces would little serve Iran’s utility, and neither would giving the US an excuse to engage in such an operation. The conflict between Iran and the US is, like the Wagah border dance, one of power in appearance. The nuclear weapons programme should also be viewed through the objectives of regional power. During the cold war, one of the obsessions of doomsday planners was survivability: would an arsenal be able to survive a first strike and retaliate? In the context of a diplomatic rather than kinetic exchange, a nuclear weapons program is more effective for Iran than an actual nuclear weapon. A physical nuclear weapon can be destroyed and gives justification for a kinetic strike on Iran. The vague idea of a nuclear weapons program spread across the country provides the defiant diplomatic fire-power combined with an opponent’s hope of negotiation without providing a justification for a strike or an actual object to destroy. No nation that has ever meant to use nuclear weapons as a serious strategic deterrent has ever made their program public before it was complete*: US, USSR, PRC, Pakistan, India, etc… Iran has made its program “public” beforehand for a reason. It is Iran’s interest to keep the charade going as long as possible, never sacrificing the diplomatically useful weapons program for a weapon that could only serve only a limited military purpose. With the political nature of the Iran conflict in mind, it is not in the US interest to begin kinetic operations against Iran. While the US has much less to lose from a conflict, the economic damage and ensuing regional instability from the loss of a major state and the unleashing of several associated terrorist organizations would be beyond crippling. As the US applies diplomatic/economic pressure and moves the military pieces around the board we are strategically positioning ourselves and shifting the state of play as the dancers weave around the ballroom. With war neither in the interest of or desired by either side, it is conflict by maneuver rather than melee. The purpose is to stay in the lead and drive the dance, not turn the room into a mosh pit where everyone loses. *North Korea doesn’t count… it never counts. That being said, this “dance” will end when Iran gains a real advantage; i.e., they have detonated a test bomb and possess enough fissile material to stockpile a credible inventory. That’s only a matter of time, Stuxnet not withstanding. To be fair, it’s one of the few ways Iran can really achieve their stated goal of becoming a recognized regional power. The soft or asymmetric approach (fomenting regional insurgency amongst their neighbors on one hand while playing the “mediator” on the other) is sort of working, but now has to compete with the moderating effects of the Arab Spring. When the bomb becomes available to them, will the US be able to restrain Israel in the interests of gaining ground with a more accommodating Arab league? If a Iran’s real objective was to get a bomb, you would be right. However, I contend that their objective is not to build a nuclear bomb. I say that actually getting to the point where the US or Israel would strike stands in direct opposition to their desire to be a regional power. A program is more useful to them politically than an actual weapon. It gives them strategic depth to negotiate. Essemtially, building a nuclear weapon would be killing their hostage. If they were not pursuing the bomb, the Stuxnet virus wouldn’t have been built. Targeting such a specific SCADA system wasn’t easy, nor would it have been possible for re-use as another cyber-virus because of it’s specialization. The way it was built, the necessary time, expertise and resources to distribute and inject it means someone rolled the dice hard. Nation-states (let’s call a duck a duck – they’re the only ones who could bankroll and deliver this) obviously believed their enrichment capability was getting them closer to the bomb. Why bluff when you’re 3/4 of the way to a full house? Undermining their program serves political and diplomatic utility as an illustration of capability, undermining of the enemy, and message to the outside world. It’s just part of the game. That said, you bluff because there are lines. Once those lines are crossed, the game changes to one they don’t want to play. They’ll maximize behind their line, and we’ll maximize behind ours. One cannot assume the intentions of one party by the actions, full objectives unkown, of a completely different party. I do think a nation state rolled hard on this one – and unlike Mr. Hipple I don’t think this was done just as a demonstration of capabilities. This does not mean that Iran actually possessed the capability the roll intended to stop. The U.S. has rolled pretty hard on non-existent WMDs before. Alternately Iran’s opaque leadership and the struggles among it may have sapped support for weaponization of the nuclear program. The program’s moves towards such ends may depend on whose orders are being followed, President Ahmadinejad’s or Supreme Leader Ali Khamenei’s, who recently pronounced nuclear weapons a “grave sin.” While both have publicly denounced a weapons program, there may be real difference of opinion or policy between the two, which may have resulted in a change in policy away from developing actual weapons. Not saying you’re wrong, just that you haven’t proven you’re right.